Saving time seems to be a major objective for design engineers – and why not indeed? – our 3D CAD downloads save loads of time – just download the industry standard IGES or STEP file you want, put it in place on your own enclosure or cabinet drawing and the job is done, with the component fully designed and dimensioned. 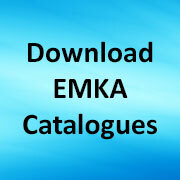 They are created in Pro/Engineer and are available for standard EMKA enclosure hardware parts such as locks, handles, swinghandles, hinges etc. In addition of course we offer a full custom design service with CAD drawings to insert into special applications from vehicle hinges to HVAC panel locks. Contact us for a consultation. Share the post "3D CAD downloads"